This image provided by C-SPAN2 shows retiring Senate Minority Leader Harry Reid of Nev. giving his final speech on the Senate floor on Capitol Hill in Washington, Thursday, Dec. 8, 2016. Minority Leader Harry Reid bid farewell to the Senate Thursday after 30 years in the chamber and more than a decade as top Democrat, a remarkable run during which he shepherded key Obama administration legislation including the sweeping health care law. But Reid leaves with his Democrats stuck in the minority despite his best efforts, and Republicans and President-elect Donald Trump making plans to repeal President Barack Obama's signature law as their first order of business next year. In an uncharacteristically lengthy and personal farewell speech on the Senate floor, Reid warned of "a new gilded age" ahead and lamented how the Senate has changed, even while declaring he loves it still. He cautioned colleagues to "temper" use of the filibuster, "Otherwise, it will be gone." And the 77-year-old gold miner's son from tiny Searchlight, Nevada, reminisced about rising from a hardscrabble beginning to the heights of Capitol Hill and his "dream job" serving as Obama's point man in Congress. With his wife, Landra, and some of his five children and 19 grandchildren watching from the gallery, and Democrats and a handful of Republicans watching from the floor, Reid said: "I love the Senate, I don't need to dwell on that. I love the Senate, I care about it so very, very much." "I hope that everyone would do everything they can to protect the Senate as an institution," he said. "As part of our Constitution, it should be given the dignity it deserves." Reid's mother took in laundry from the town's brothels; his father shot and killed himself. Yet Reid said there was happiness in his childhood, even if he and his siblings' games included tossing rocks at the tin siding on the latrine when his mother was inside. He boasted of graduating in the top third of his elementary school class — of six — and of his proudest moment — buying his mother a new set of teeth. Reid never mentioned Trump, whom he had railed against endlessly in the run-up to the election. Earlier Thursday, in an interview on NPR, Reid remarked of Trump: "I have to say this — he's not as bad as I thought he would be." Reid will be succeeded as leader by New York Democrat Chuck Schumer, of whom he said during his floor speech: "He won't be me, but he'll do a good job." Later Thursday Reid's portrait will be unveiled on Capitol Hill, and failed Democratic presidential nominee Hillary Clinton will be among those attending the event. A taciturn master of the inside game, Reid was a skilled legislative tactician whose maneuvers on Obama's behalf are responsible for passage of every major bill the past eight years, from the economic stimulus package to health care and the financial overhaul bill. At the same time, Reid brought home major benefits to Nevada, funding countless projects, blocking a nuclear waste dump and helping protect many thousands of acres of wilderness. Reid talked about doing battle with coal companies trying to expand operations in Nevada, and in a line that could sum up many of his encounters, he said: "They tried. I won. They lost." 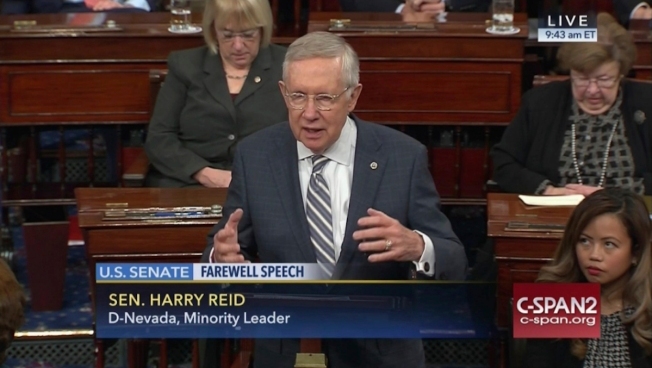 Thanks to Reid, Nevada was a bright spot in Democrats' electoral wipe-out last month. Clinton won the state, and Reid ensured a Democratic successor, Catherine Cortez Masto, who will be the first Latina senator. Following him on the Senate floor, Reid's home-state colleague Republican Dean Heller said: "It's been said that it's better to be feared than loved, if you cannot be both. And as me and my colleagues here today and those in the gallery probably agree with me, no individual in American politics embodies that sentiment today more than my colleague from Nevada, Harry Mason Reid."